To start at the beginning, ICA stands for Independent Computing Architecture. 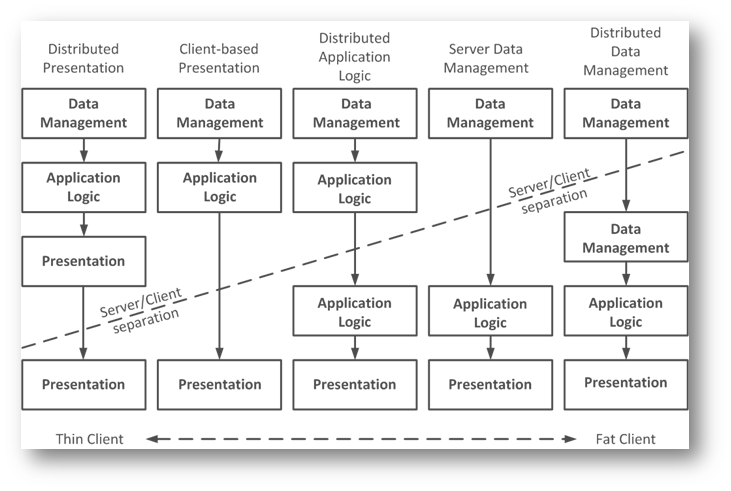 It is a protocol used in Citrix XenApp / XenDesktop (or previously Presentation Server, MetaFrame, WinFrame) to separate the application logic (which runs on a remote system, usually in a datacenter) and the presentation (on the client). In a nutshell what this protocols does is sending input from the client (like keyboard, mouse, audio, etc.) to the remote system and receive the output (like video, sound, etc.) from the remote system via the network. On the client (a workstation, laptop or thin client) a piece of software is used to handle this traffic. At the moment of this writing the Citrix Receiver is used. Files with the extension .ICA contain information required to connect to the remote system, including session properties and (optionally) authentication. Files with an .ICA extension are associated with a Citrix ICA client. This is done via a File Type Association (or FTA). In the registry hive HKEY_CLASSES_ROOT a key with the name .ica specifies the name of the file type and the content type. The name is correlated to the key HKEY_CLASSES_ROOT\<key name> and describes how the file is handled, what icon to show, what items should be visible in context menu etc. "C:\Program Files (x86)\Citrix\ICA Client\wfcrun32.exe" "%1"
.ICA files are stored in plain text with ISO/IEC 8859 encoding (except for older ‘legacy’ clients) so they can easily be viewed and edited in a basic text editor. The content is stored in the INI file format with a basic structure composed of “sections” and “properties”. Each section has properties (or settings) assigned, some of there are mandatory but most are optional. In the next sections I’ll explain the most common settings and the not-so-common settings that are available. Each section contains a list of properties (or settings) that can be set. I’ll describe the most common settings per section, a larger (not complete) list of properties can be found in the ICA Settings Reference on Citrix eDocs. This section contains setting(s) that describe how the file is encoded. In the example the .ICA file is stored in the default encoding, ISO8859_1. Description: Describes the character encoding type of the .ica file. This information is used by the client to convert and understand the .ica file if the Web server that created it used an encoding type that is different from that of the the client. EUC-JP Extended Unix Code (EUC) is a multibyte character encoding system used primarily for Japanese, Korean, and simplified Chinese. In the example a server with the name server01.domain.local is contacted on port 80 to supply details about the server or published application / desktop that is supplied in the [ApplicationServers] section. During the connection the Desktop Viewer is used and a Connection Bar is shown. After the connection is broken the .ICA file is removed. Description: Enables or disable using the Print Screen key on the keyboard while the ICA session is running with seamless application. Description: Specifies whether Client Drive Mapping (CDM) is allowed or not. Description: Enables or disable the use Desktop Toolbar (and the Desktop viewer) for all connections in the .ICA file. More details can be found here. 1 The desktop viewer (cdviewer.exe) is used instead of the ICA client (wfcrun32.exe). Description: Specifies whether or not to use the same user name and password the user used to log on to the client device for authentication through .ica files. For security reasons, users cannot be authenticated to the server unless this parameter is present and its value set to On, even if UseLocalUserAndPassword and SSOnUserSetting are specified in the .ica file. Description: Specifies the location of the browser server (usually the data collector since it holds the most accurate information of the farm). Description: The version of the ICA file structure. Contains one (or more) connections that are stored in the file. The “more” connections is a legacy option used in the Program Neighborhood that has been removed in version 11.1 – CTX121727 (june 2009), the connections where stored in the appsrv.ini which had the same structure as the ICA file. In the example a connection with the name Desktop is present. When the .ICA file is executed by the client software, the properties are read in [Desktop]. Description: The name of the connection, the properties of this connection are located in the section with the name name (%ConnectionName%). Depending on the version of the client this name is (shortly) visible for the user during the connection phase. The section has the name of the connection that is supplied in the ApplicationServers ‘list’. In this section the properties are set for the connection. This is the most extensive list and therefore segregated in separate areas. In the example the settings for the connection Desktop are supplied. A seamless connection will be made to the published application Desktop with a connection bar (and the Desktop Viewer) visible. Both Session Reliability as Client audio are enabled. The connection is made with compression and encryption enabled whose details are specified in section [Compress] and [Encrypt]. This area describes the general properties of the connection. Connect via WebInterface / CloudGateway: A semicolon (;) separated string containing the application / desktop to connect to, the secure ticket authority (STA) and the secure ticket (or token). The user can click an application / desktop and will effectively download a launch.ica which will be processed by the Citrix client (receiver). Description: Specifies whether the ICA traffic needs to be compressed before its transported. Connect directly to server: The location to the executable to launch. If the value is empty the default shell is loaded. Description: Specifies the name of launch mechanism (that is, the client launcher name). This parameter is used to launch multiple ICA windows from the startup folder at logon time. Description: Reference token for a specific session on a Citrix XenApp server. This enables the Citrix SmoothRoaming feature, it directs the user to the same server as it has an existing session. Possible values: Reference token for a specific session on a server (generated by the WebInterface). Description: Specifies client authentication token for web interface. The client handles an authentication token in the form of an opaque LogonTicket with an associated interpretation defined by the LogonTicketType. This functionality can be disabled by clearing the Web Interface 4.5 and above check box. Description: Specifies the logon ticket type for "Web interface authentication ticket". Use this policy to control the ticketing infrastructure used when authenticating through the Web Interface. The client handles an authentication token in the form of an opaque LogonTicket with an associated interpretation defined by the LogonTicketType. Citrix STA versions are described in CTX108302. Description: This parameter specifies whether or not to use the persistent disk cache. The persistent disk cache stores commonly used graphical objects such as bitmaps on the client device’s hard disk. Description: Specifies the session sharing key. The sharing key is a combination of all attributes that allows you to reuse an existing session: colors, encryption, audio, credentials and farm. If any of these attributes are different (not 100% identical), a new session is created. For more information read the article of Thomas Koetzing about this topic. Description: Specifies whether or not SSL is enabled. When SSL is enabled all ICA traffic (1494 or 2598) is tunneled via a secure socket layer (SSL) tunnel via port 443 (by default). Description: Specifies the hostname of the SSL proxy when SSLEnable is set to ‘On’. This value is not present when traffic is not tunneled via SSL. The name on the certificate has to match the hostname (FQDN). <FQDN>:443 An explicit server is specified as the SSL relay server (for instance an Citrix Access Gateway). Description: This parameter specifies the transport protocol to use to connect to the specified connection or application set. This name must correspond to one of the transport drivers specified in the TransportDriver section of Module.ini. NetBIOS The Network Basic Input/Output System (NetBIOS) protocol is used to transport the ICA traffic. Description: This parameter is useful in performing Network Address Translation (NAT). If set to 1, it defines whether to use the alternate address for ICA connectivity across a firewall or a router. 1 Use alternate address for firewall connection option. This area describes the settings that relate to audio [HDX]. Description: Specifies the audio bandwidth limit and, by extension, the audio quality for the connection. Higher audio quality requires more bandwidth. Description: Specifies whether or not to enable client audio mapping. Description: Enable access to audio capture devices. Use this policy to enable and restrict the remote application or desktop access to local audio capture devices (like microphones). Description: Enables or disables the real-time transport of audio over UDP. Description: Specifies whether or not audio playback will occur through HDX MediaStream Multimedia Acceleration. This area describes the settings that relate to display like color depth, resolution and video [HDX]. Description: Specifies the preferred color depth for a session. 8 True color (24/32 bpp). This is 32bpp, unless the administrator explicitly prohibits a server from supporting a 32-bit session. In that case, the session is downgraded to 24bpp. Description: This parameter defines the horizontal window size in pixels. For Citrix Receiver and up : If TWIMode is set to Off / False, this parameter is used. For older Citrix clients: If DesiredWinType is set to Custom, this parameter is used. Possible values: The horizontal window size in pixels (Default : 640). If you set both DesiredHRES and DesiredVRES to 4294967295 the session will always launch in full screen (thanks Andrew Morgan). Description: This parameter defines the vertical window size in pixels. Possible values: The vertical window size in pixels (Default : 480.) If you set both DesiredHRES and DesiredVRES to 4294967295 the session will always launch in full screen (thanks Andrew Morgan). Description: This parameter specifies the default desired window size for custom connections. This setting is ignored by the Citrix Receiver. Description: Specifies whether or not to enable the HDX MediaStream Multimedia Acceleration. Off The video is always rendered on the client. Description: Specifies whether or not to use seamless mode for the connection. This area describes the settings that relate to security. Description: The parameter specifies the password for the supplied credentials in clear text. This is less safe than the encrypted Password setting. Description: Specifies the encryption level of the ICA connection (SecureICA). Since the Citrix Receiver a section with the corresponding name should be provided including the drivers. Description: This parameter specifies the user domain for the supplied credentials. Possible values: The name of the domain for the supplied credentials. Description: This parameter specifies the password for the supplied credentials. The password must be encrypted. Possible values: An encrypted password. Remko Weijnen has written a tool to Encode (and decode) Citrix Passwords, you can find the tool here. Description: Specifies whether or not to use the same user name and password the user used to log on to the client computer for authentication to the Citrix server. SSOnUserSetting must be set to On. Description: This parameter specifies the username for the supplied credentials. Possible values: The username for the supplied credentials. Contains the name of the drivers use for compression as specified in the Compress setting in the %ConnectionName% section. In the example the default drivers used for compression are specified. Description: This parameter specifies the name of the DOS driver file to load. Description: This parameter specifies the name of the Win16 driver file to load. Description: This parameter specifies the name of the Win32 driver file to load. Contains the name of the drivers use for encryption (SecureICA) as specified in the EncryptionLevelSession setting in the %ConnectionName% section. The name of the section equals the value of the EncryptionLevelSession setting. In the first example the default drivers used for encryption (SecureICA) are specified. In the second example the drivers for each encryption level (SecureICA) are specified in a separate section. PDC0W.DLL The driver file used for RC5 (128 bit – Logon Only) encryption. PDC40W.DLL The driver file used for RC5 (40-bit) encryption. PDC56W.DLL The driver file used for RC5 (56-bit) encryption. PDC128W.DLL The driver file used for RC5 (128 bit) encryption. PDC0N.DLL The driver file used for RC5 (128 bit – Logon Only) encryption. PDC40N.DLL The driver file used for RC5 (40-bit) encryption. PDC56N.DLL The driver file used for RC5 (56-bit) encryption. PDC128N.DLL The driver file used for RC5 (128 bit) encryption. When are .ICA files used? .ICA files are used in many applications that allow you to connect to a Citrix XenApp / XenDesktop environment. Most common used are the Citrix Web Interface and the Citrix CloudGateway, but third party applications like Denamik LoadGen use .ICA files as well. Usually the use of .ICA files is temporarily and hidden for the end user, which is a good thing. When you launch a published application / desktop via the web portal supplied by Citrix (WebInterface, StoreFront or VDI in a box) a default configuration is applied. You can alter the default configuration to meet your needs, if it isn’t available in the management console (most settings are not configurable via the management console). The default configuration is stored in a default.ica file. The location of the default.ica depends on the platform you’re using and the name of the site. Since both WebInterface and StoreFront are integrated in Microsoft Internet Information Services (IIS) the configuration is stored in a directory in the %SystemRoot%\inetpub (default location). For each site a directory is created which you specified when you created the site. Thanks Andrew Morgan for locating the default configuration for Storefront services and VDI in a Box. If you want to change the setting / behavior of a specific published application / desktop you need to add the published resource in the [ApplicationServers] section and add a [%ConnectionName%] section with the required settings. It is important that the name of the connection (%ConnectionName%) is exactly as it is shown in the application set of the management console. How can I create an .ICA file? The first option, manual, is of course an option but it’s quite some work for an easy task. Keep in mind that the Citrix Receiver (or older clients) are rather restrictive with the information it returns. If there’s an (syntax) error in the ICA file… well, in most cases you need to sort that our yourself. The second option, the Citrix ICA File Creator, is a less time consuming option than creating it manually but is a bit clunky. It works, but it’s not the best tool (and unsupported). The third option is the Citrix Quick Launch tool ,which is also provided by Citrix (and unsupported, btw), and is built to offer some features of the deprecated Program Neighborhood (CTX121727). IMHO this is the best way of building ICA files Not only because it offers the most features (it is recently updated) but also because you can connect and test the connection immediately! PS: The Citrix Quick Launch works even on desktops with 125% DPI (default with a resolution of 1920×1080 on my laptop)! So kudos to the developers who where willing to build a version that supported 125% DPI (and James Denne – @JimmyLeroux – for contacting them). Did I miss anything or do you have a suggestion? Let me know in the comments. Our users run a seamless full desktop session to our citrix server – but when they press the print screen key, or alt Print screen, nothing in the seamless desktop session is captured to the full desktop clipboard…..instead, if you press print screen then log off the citrix session then paste into paint.exe from the local client, it will paste a copy of what was on the seamless desktop at the time you pressed print screen…….so the print screen is capturing the correct data (i.e. what is happening in the citrix session) but it is storing it in the local PCs clipboard memory and not the clipboard that is avaliable to the citrix session. Can we make it so the citrix session can have access to the local clipboard memory or is there another way to get print screen functionality happening inside our citrix sessions? Issue at the moment is, when we press paste in side the citrix session after pressing print screen, nothing pastes into word/paint…..but log out of the citrix session and paste into paint/word on the local PC and our print screen appears. At the moment we are using PS4.5 and ICA client v10. We are using this reg key as a work around at the moment…it turns the f12 key into a print screen key and that is working for us. Thanks in advance and hopefully you can point me in the right direction. Have you tried setting AlwaysSendPrintScreen=On in the [WFClient] section? Turns on or off the ” AlwaysSendPrintScreen” attrtibute in seamless application. By enabling the key, user can use the ” Print Screen” key on the keyboard while an ICA session is running with seamless application. I tried setting the “AlwaysSendPrintScreen” key with a new string value with the data value of “On” – that is in HKLM-software-citrix….WFClient. I restarted PNA and tried connecting to the seamless desktop again but the print screen key still was not pasting from the clipboard into the citrix session. Howerver it seems that the print screen key is working and being passed to the citrix session but the print screen image is being placed in the local computers clipboard….because when i minimise down to the local machine and paste into word…the print screen of the seamless session is shown. It seems that the print screen functionality is working….but the seamless session cannot get access to the local clipboard….how can i enable that? How can i allow the seamless full desktop session to access the local machines clipboard….or make the citrix session pass the print screen key into the citrix session so that the full desktop/server clipboard is used to store the print screen image. Not sure why this is not working or what others have done to resolve this print screen functionality. The “AlwaysSendPrintScreen” needs to be set in the ICA file (hence the title of the article), not in the registry. 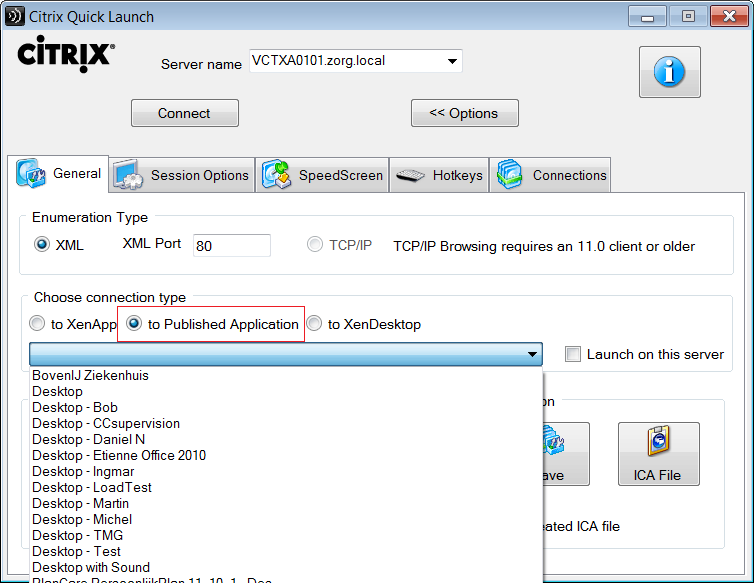 You can set this in the default ICA file of the XenApp services site. If the content of your local desktop is paste into the Citrix session you’ve enabled clipboard redirection, so it works as designed. Sorry – i applied your setting to the ICA file as you explained (from the web interface, i right clicked the ‘desktop’ app then saved to desktop to get an ICA file that i can modify) – i added the key you mentioned AND IT DID WORK!!! now when the user presses the print screen or alt print screen key the correct thing is pasted INSIDE the citrix session! THANK YOU :)…..but wondering if you can explain or tell me how i can make this ‘key’ a permanent part of the published desktop app? Can i modify the ICA file on the servers that are given out to the clients when they access the published app list? Reason being is that when i save a copy of this ICA file, i have to modify the server IP address – we have 3 citrix servers to i dont want to direct all sessions to the one server – i want the citrix server to manage the load…..i also dont want to have to maintain this separate ICA file as users connect to us from different computers all the time….so getting them the ICA file is a pain. How can i add this key to the ICA file that is given out by the citrix servers? Where is the ICA file that the server gives out constructed from? Does it just build the ica file at the time the user clicks the published desktop and bases the contents off the settings i apply when i created the app with the citrix management console? Can i set this key anywhere in the CMC so that it applies to the ICA file that the server gives out for this full desktop? Glad to hear the proposed solution worked! There’s no need to change the ICA file manually. You can change the default settings that are applied by the WebInterface (the service that communicates with the PNagent) by setting the appropriate setting in %systemroot%\inetpub\wwwroot\Citrix\PNAgent\conf\default.ica. The location migth be different if you’ve changed the location of the IIS website or named the site differently, but I’m sure you’ll manage to locate the file. I found the ICA files you mentioned – the default.ica files and made the changes in there. The settings were then successfully applied to sessions that were started from the Citrix Web Interface…..HOWEVER, the settings did not apply to sessions launched via the PNA! I did a little more digging around and just in case someone else stumbles upon this issue, i did manage to get it working. In order for the sessions launched via PNA to correctly use the print screen and other windows keys, i had to edit the config.xml file of the PNA in the CMC. Access the CMC – expand web interfaces – find your PNA site – expand that to get your config.xml file – right click it and choose change session options – in here choose client resources and then under ‘targets of windows key combinations’ make sure the only one that is ticked is ‘in full screen desktop’. Our problem all along was that all of these tick boxes were selected, the PNA clients were all set to choose the default setting and because all of these were ticked here, i assume it just selected the first item in this list as the default which is ‘on the local desktop’!! So i have now modified the ica file to include the key you mentioned – that fixed the problem for sessions launched from the web interface…and i have also modified the PNA config file to fix the issue for sessions launched internally via PNA. Excellent work, Ingmar. It’s non-trivial to find info on ICA files, and you’ve done us a great service. Here’s an additional attribute you might consider documenting: “Clearpassword”. It’s the same as Password, but it doesn’t need to be encrypted (so Remko’s tool you referenced isn’t needed). I am trying to get the ICA File Creator tool hidden in the Citrix KB as Citrix Quick Launch is the preferred method to create ICA files and I do not maintain ICA File Creator anymore. Well spotted for the 125% DPI support as I personally don’t use it therefore I did not realized it was that needed !! Great article, can you tell me if you can change settings for the flash optimization to be on, as well as the file access settings via the default.ica. I see settings for the mic but not for the webcam, does setting the mic also change the webcam? The flash optimization cannot be configured in the ICA file, the answer to the dialog you’re referring to is stored in the registry. It can be configured via a GPO (http://support.citrix.com/proddocs/topic/xenapp65-admin/hd-flash-enable-client-ad.html). Is it possible to create an ICA file that connects a web interface requesting for published application resource from another Farm (added to the WI) and then connects to provisioned XenApp server? I can only get this working with a specific server or dynamically within the servers of the farm that provides the WI. But if I add another farm to the WI, I cannot create a working ica file which would connect the WI requesting the published app on this other farm. I am using the Citrix Linux receiver. In the wfcmgr I can see all apps from both farms in the XenApp view. But with the Connection view I only see the apps from the farm that provides the WI. Same issue when trying with the Citrix Quick Launch – I only see applications from the first farm, not from the second farm that is added to the WI (note: for both the XenApp Web Sites and the XenApp Services Sites). Note: I can see all the applications from both farms when logging in with the browser to the XenApp web site. No, you can’t. 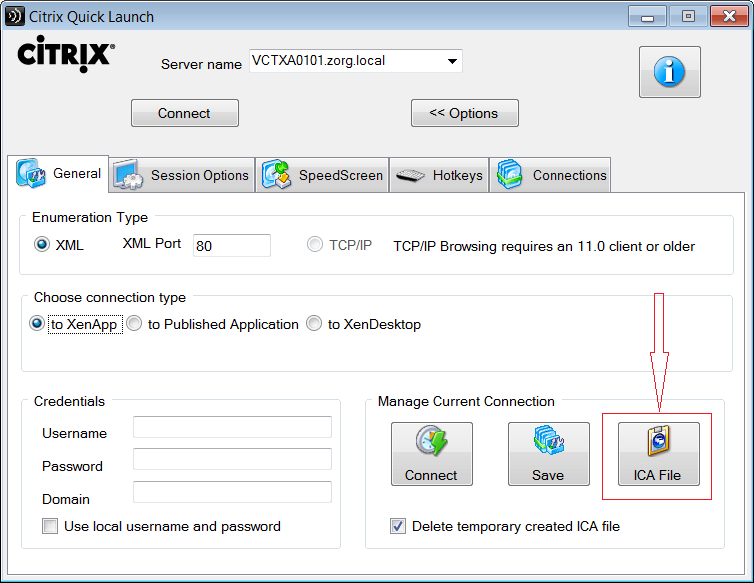 The ICA file can only connect to a Citrix XenApp worker server or a XenDesktop VDA and connect to a session. You mention it is possible for XenDesktop VDA. I have not been able to do that either. What I have tried doing is started a xendesktop session from the wfcmgr and saved the temporary ica file and the commandline used with wfica. Trying to use the exact same command and the preserved .ica file does not work. I’ve tried also to tweak the .ica file and find a working version. Seems that there are some session specific things in the temporary file. I recommend you first test the connection with the Citrix Quick Launch tool (incuding a XenDesktop option) and than save the working ICA file. That sounds quite cumbersome, I can’t think of a situation where you have to test thousands of users. Isn’t there a better implementation with LoadRunner? You might want to look at Denamik LoadGen? If you want to use ICA files with a different username in each file you’d probably have to write a batch / vbscript / powershell script. Shouldn’t be to difficult? Thanks, Ingmar for your valuable inputs. We have .NET application hosted on Citrix XenApp(v6.5). We are planning to do load test for that. We have looked into Denamik LoadGeb. It is a commercial tool. Is their any open source tools to do load test? ue as like as ie.visible =true; please let me know; which property I have to use in icaclient? I suppose your automating the connection using the ICA client as an ActiveX object, is that correct? Are you using the Citrix Receiver or Citrix Receiver Enterprise (Legacy PNA)? Thanks for the valuable information posted. I have and issue state below please reply me on my mail id. ;LocHttpBrowserAddress2= ====>New Added IP address. it was not workng and we were not able to access the Address2, Could please suggest on this. Do you know how I could check the ICA compression and encryption settings? What is it that you want to check? What compression/encryption is used in a session? Open OLE clipboard null parameter, which under normal conditions does it work? I’m sorry but I don’t understand your question? Inside this software it calls an external vendor called ApproveRX. It provides the FORMS that the user can retrieve, but gets a message “Failure to retrieve pre-filled form from ApprovRx”. when I login as an ADMIN, everything works fine. hoping I have explained enough for you to see my issue. Thank you so much for this Article. Really very helpful. Appreciate your time you took to share with us. Thanks again. Using LoadRunner and ICA config files, the AUT crashes when the number of users increases. What parameters in the ICA config file may need to be changed/increased? There are no specific parameters for multiple sessions. You might want to check at HP for stability issue with LoadRunner. Thank you for your useful post!! I want to manipulate the ICA encryption level. After I “Enable SEcureICA” on the delivery group, use a policy applied to that delivery group to set the encryption at RC5-56 (for example), the encryption level on the client (as seen by Citrix Connection Center) is still RC5-128 (not RC5-56 like I want) so it seems like the policy isn’t working. We want to do testing with all the encryption levels. Article below suggests there may be 128 bit encryption on the client that’s overriding the 56 bit encryption? Do you know how I would address this and properly manipulate the encryption? How to enable pass-through mechanism in Linux citrix receiver 13.1 ? In the section “If you want to change the setting / behavior of a specific published application / desktop you need to add the published resource in the [ApplicationServers] section and add a [%ConnectionName%] section with the required settings. I am currently building a macro to pull listed information from an application in a Citrix Seamless Window, originally I was able to pull from the Window Title but all the information I need is truncated. Is there a way to pull the information using any kind of scripting, PowerShell, VBScript, JScript…? I have been researching for weeks and have yet to find a viable solution. Is there a specific port that an XML broker users to enumerate applications? I have an ICA file that runs just fine on an environment in the same LAN as the XML broker, web interface server, etc., but it fails when I try to run the same file from a satellite office that has a site to site VPN configured. When running the Citrix Quick launch utility on the main network, I can select “to published applications” and see the full list of published applications enumerated in the drop down menu. When I’m on a workstation at the satellite office, however, and try to use the quick launch utility pointed at the same XML broker IP address, I get an error message stating “Error: could not get the list of published applications” when I select the ‘to published application’ radio button. I can telnet to the IP address I’m using in CQL from the satellite office over port 80– which is what is being used as the XML port for the farm on the web interface– and can also launch applications using the online plug-in from the satellite workstation. I can also get a published desktop session by checking the ‘to XenApp’ radio button in the Choose connection type section of the quick launcher. Is there an additional route that needs to be configured on the VPN perhaps, a specific port that needs to be opened on either side, or is there something else going on? I am trying to disable the short cut keys that Citrix has reserved (like Shift +F2) or remap them to different keys as this is interferring with some of our applications (like bloomberg) that run either in Xendesktop (5.6) or XenApp (6.5). I tried updating the default.ica in the storefront(2.5) and that doesnt seem to be working. Any ideas on how I can do this? When i pass the KeyboardLayout = Russian in wficlient.ini, in windows it shows the russian language selection bar, but does not reflect the russian language only english language is printed??? Am I missing something ??? Is it possible to get the actual path to the application executable (c://program files…/notepad.exe) from the ica file? Our system got upgrade and now it doesn’t have an option to choose the resolution, it wants to open everything full screen. Do you know of any way to change the config of Citrix Receiver so that it overrides what is in the .ica file? How do you capture an ICA file that automatically launches the remote app? I have some ICA files already in case the portal is down, the ICA file still works to get in. However, they changed the IP addresses and I can’t seem to find the new ones. If I could capture the ICA file I could find out the new IP addresses? Thank you. This gave me a lot of insight into the cranky little file known as launch.ica. I’m using Linux Thinstation as a test OS (potentially will be put into production) and trying to set up Citrix to auto-connect to our Citrix environment and then auto-launch the desktop. Under the [%ConnectionName%] I see there is an “Address” and an “InitialProgram”. How do I use these properly? Do I put the Address as the FQDN and then the InitialProgram to #MyDesktop? Great stuff. Comprehensive and covered in detail. thanks for the article. Can I use the compress command in the default.ica file for a Citrix Storefront Server Version 3.6? I found that if we copy an ica file from PC1 to PC2, we can still initiate a session on PC2. And my customer has concern on this, and wants to know if there’s a way to prevent the ica file been launched on other PCs? I have not been able to find a clear answer on this. I own a Benchmade SOCP fixed-blade neck knife, can I cary it in California openly or concealed? This is a list of over 900 English lessons. You can click on any lesson below to study for free. There are over 9000 audio files to help you improve your English speaking.